You just never know who you will run into when sitting and waiting for your daughter to finish dance class. Several weeks ago I had the pleasure of conversing with the creator of the website that brings us today's product review and giveaway. Courtney is the mom to two beautiful girls and created a website, Bright October, that specializes in eco-friendly, naturally made, and creative toys. Several years ago when her first daughter was born, she became disenchanted with the commercialized, character-driven toy world and instead sought for toys that stimulated creative play, imagination, and fun. She also wanted safe and natural toys that taught kids to appreciate the planet. Her website, Bright October, (so named because the "day they brought their daughter home was the brightest day in October" - sweet) is the culmination of her search for the perfect child's toy. Bright October has a wonderful website neatly arranged in categories such as age, type of toy, brand of toy, and price range to make your shopping easier. Their shipping costs are low, only $3.99 for standard or free if your purchase totals over $75. They have a wonderful 90 day return policy if you are not satisfied with your product. Sign up for their newsletter and your next purchase will receive a very generous 10% off discount. Just look at some of the adorable toys the kids and I got to preview from her site. This is an adorable toy for our little baby to be. 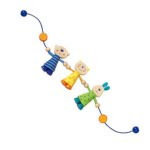 It's a pram decoration from Haba. It will no doubt be tons of fun for the baby to look at and touch and my other two can't seem to take their hands off it as I keep finding it in their rooms. The figures are made of beech wood and they are connected by a sturdy elastic cord. So cute! This my friends, in the last three days, has become my 5 year old's favorite doll. She has literally taken it everywhere we have gone including a bike ride. It's the Blabla Coral Doll. This doll is hand-made, 100% cotton and so soft. The pictures don't do her justice as she is about 22 inches long. I'm pretty sure every little girl needs one of these! Check out all the fabulous Blabla Doll styles here. This is a really neat toy that I had never seen before for my little guy. It's an Automoblox T9 Pickup. The body of the pick-up is constructed of solid maple and as you can see in the bottom picture, every piece of this this truck comes apart. My son, C., has had tons of fun pulling this thing apart and putting it back together. There are more styles of cars and trucks in the Automoblox line and your little one can mix and match pieces making their own creations. This is number one on my list right now to purchase for my nephew for Christmas! Shhh! Don't tell him. Just in time to start your Christmas shopping, Courtney has generously offered to give one of our readers a $50 gift certificate to spend on her site. Entry to the giveaway is easy. Here is what you need to do. Visit her site Bright October and select a favorite toy. Leave a comment in our comments section telling us about that favorite toy and who you would purchase it for this Christmas! The giveaway will end Wednesday, November 11th at 12 p.m. and the winner will be announced later that evening. My son loves the Automoblox, and I would love to get him some for Christmas. I hope I win - because it would put my 3 year old over the moon! I love the Goodbyn lunch boxes. I know it's technically not a toy, but it could doulbe as one. :-) It's cute, BPA free, and made in the USA. I would love this for my daughter. Hi, Thanks for sharing this web site, I have never heard of them before. I love the lunch boxes and I think my son would enjoy the truck that you can build! This is a great giveaway! My son would love any of the Woody Click toys. Thanks for the chance! Pick ONE favorite? You're kidding, right?!?!? What a GREAT site, so glad you posted it to HMN!!! I could do some serious damage at Bright October; they have some of my son's favorite things, like the Blabla dolls... I'd love to get one for my new nephew for Christmas. I love all of the play food from Haba - my DD is getting a play kitchen for Christmas and I hope to stock it with some of these adorable little goodies :-) The GC would definitely help! Thanks for posting to the HMN loop mama! Love the Bright October website. And the toys actually seem reasonably priced! I love the soft doll lilli from Habba. The up-do is great and makes it a little more stylish for an older girl. It's perfect for my 9-year-old niece. Thanks for posting such a cool site and this contest. What a generous offer! I think we'd get the Automoblox. My son has one already and LOVES it. We'd love to try mixing and matching. I'll be bookmarking that site! I would get the c9 sports car automoblox because my 4 y.o. is totally into Legos and like this alternative much better! Or the Goodbyn lunch box because it's affordable, cute and best of all made in Michigan!! Great site! Many familiar brands but I would have to say that one I hadnt seen was "Vilac" and their plane with crew is perfect for my 3yr old son who has been requesting a plane that has people! what a generous offer! thank you! my son would love the click clack ball track by haba. and i would love to get him one! Thank you for sharing this great website! So glad I am staying up to read my HMN Digest emails! My 4 y.o. son would love the ghost tower and knight's castle from Haba. Anything with wheels would work for my son! :-) If I won I'd get him a couple of the Vilac cars in different colors.